A Christmas Carol – Christmas classic! This Christian movie is definitely considered a classic! Many families gather round around the television every Christmas to watch this story be told onscreen. There’s been a big amount of versions that have been released over the years be it animated or with actors on the screen. 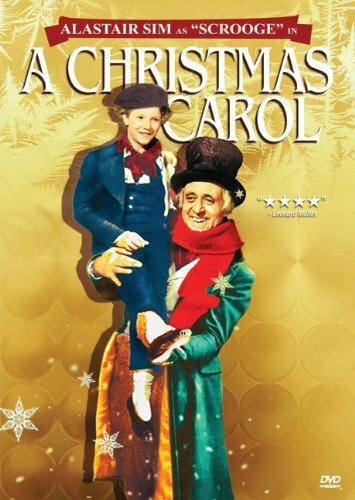 This versión of A Christmas Carol, however, is one released in 1951 starring Alastair Sim. A Christmas Carol is about an old miserable man who doesn’t necessarily like Christmas is granted an opportunity to redeem himself when he is visited by three ghosts on the night before Christmas day. This Christian DVD begins on Christmas Eve in 1843 and we meet Ebenezer Scrooge (played by Alastair Sim) who is leaving his job at the London Exchange. We quickly notice two things, first that he doesn’t like Christmas and has no plans to celebrate the Holiday. Second, that he’s not considered a giver as he doesn’t show mercy to a man who owes him money and in the streets, he denies giving a donation to the poor. His nephew Fred invites him for dinner but Scrooge seems to be not in the mood to be with family. At work reluctantly he gives his clerk Bob Cratchit the day off but demands that he be back at work the next day. The man is like his name, a Scrooge. That night Scrooge hears bells ringing and suddenly a ghost appears before him. The ghost looks like Scrooge’s partner, Jacob Marley, who had passed away a few years back. Scrooge, of course, believes he’s hallucinating but soon realizes that the chained ghost is actually in front of him. Marley is quick to inform Ebenezer Scrooge from A Christmas Carol that he has to repent of his ways or he will be walking the earth forever chained by his own greedy decisions. Marley also lets Scrooge know that three ghosts will visit him and that he’ll meet the first ghost when the clock strikes one. At exactly one o’clock, the Spirit of Christmas Past visits Scrooge and gives him a glimpse back into his past. He sees himself at school when he was younger and how alone he felt since his father didn’t seem to want him and his mother had passed away during childbirth. Then he sees himself a bit older at a Christmas party held by his former employer, Fezziwig. In this moment is that he realizes that his boss Fezziwig brought a great moment to his staff without spending a great amount of money. But also he sees the beginning of his erroneous ways after he let the pull of money make him abandon his faithfulness to Fezziwig. Scrooge relives his sister Fan passing away and how that filled him with much sadness. Then other bad decisions that he made along the way lead him to where he is now. Later in this Christian DVD, the Spirit of Christmas Present visits Scrooge from A Christmas Carol. The ghost shows him how people are celebrating Christmas and even how people with very little money are singing Christmas carols joyfully. For example, the Cratchits who even though they’re poor, they approach Christmas with much happiness and use the resources they have to celebrate in the best way. The Cratchits youngest son Tiny Tim is sick with tuberculosis and the Spirit informs Scrooge that the boy will not survive. The Spirit repeats all the mean remarks Scrooge had made beforehand about how the poor are better off deceased. The Spirit of Christmas Present continues to show him how different people he knows are currently living. Now in this Christian movie, Scrooge thinks all of the things he’s seeing is too much to bear so he tries to run away but to no avail when he meets the Spirit of Christmas Yet to Come. The Spirit does not speak but shows him what’s in store for the future if he doesn’t change his ways. Scrooge sees the Cratchits mourn Tiny Tim, also some of his employers gathering his things as he too has passed away. Scrooge sees the arrangements for his funeral and how his grave is lonely as in nobody has gone to visit it. Scrooge cries out in repentance and promises to change his ways. Will it be too late for Scrooge? What will he do to make things right? Find out by purchasing the Christian movie A Christmas Carol in the Fishflix store!